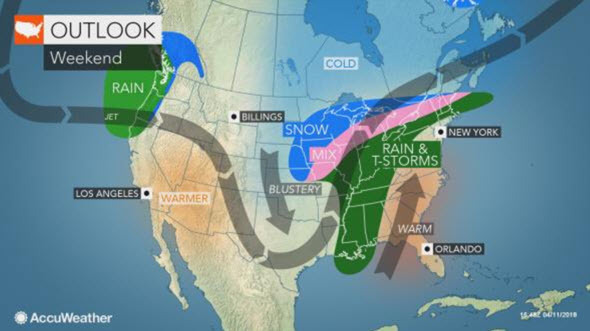 AccuWeather Global Weather Center — April 11, 2018 — AccuWeather reports a major storm will bring heavy late-season snow and blizzard conditions from portions of the northern and central Plains to the Upper Midwest from Friday to Sunday night. The area likely to receive between 6 and 12 inches of snow is forecast to extend from eastern Montana to northeastern Wyoming, much of South Dakota, southern North Dakota, northern Nebraska, much of southern Minnesota and northwestern Wisconsin. Blizzard conditions are projected from much of Nebraska, South Dakota and southern North Dakota to central and southern Minnesota to northern Wisconsin. 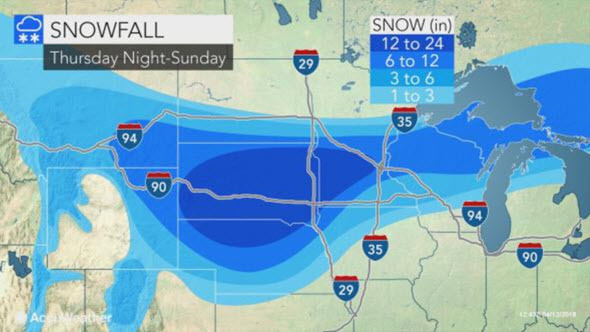 Other major cities in the region likely to be adversely affected by the snowstorm include Sioux City, Iowa; Valentine, Nebraska; Rapid City, Huron and Pierre, South Dakota; Miles City, Montana; Ortonville, Minnesota; and Eau Claire, Wisconsin.